Oil on canvas, 40 x 33 cm. 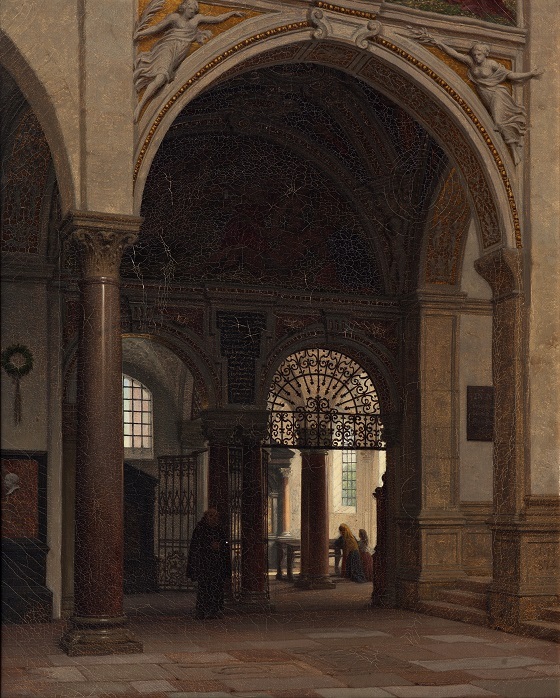 In this architectural study of the interior of the Church of Santa Maria delle Grazie in Milan, Heinrich Hansen not only captures the architectural characteristics of the church and convent, but also the varying inflow of light and its effect on the area. A monk has just entered the grandiose church, while two women can also be seen praying in front of an altar in a small side chapel. The artist has carefully portrayed the sunshine pouring through the windows and illuminating the small side chapel and two women in prayer. The warm light works as a balanced counterweight to the dark entrance in which the monk finds himself. This harmonious relationship between cold and warm shades is reflected in the tranquil and contemplative state of both the hooded monk and church-goers.